The all-new ONPOINT system boasts an intelligent, streamlined design that eliminates the risk of service interruptions due to environmental conditions or marginal site locations. 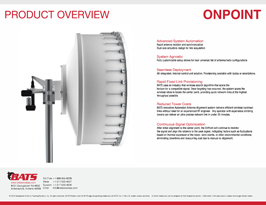 The new design provides a step-up in the deployment of fixed point-to-point wireless links, allowing the system to regularly align, monitor, and re-optimize highly critical broadband connections; eliminating downtime and recurring cost due to manual re-alignment. Rapid antenna location and synchronization. Dual axis actuators re-align for link acquisition. All-integrated, internal control unit solution. Provisioning available with laptop or smartphone. 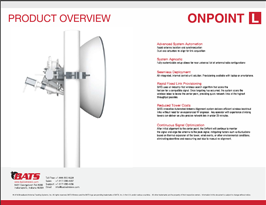 After initial alignment to the center point, the OnPoint will continue to monitor the signal and align the antenna to the peak signal, mitigating factors such as fluctuations based on thermal expansion of the tower, wind events, or other environmental conditions, eliminating downtime and reoccurring cost due to manual re-alignment.